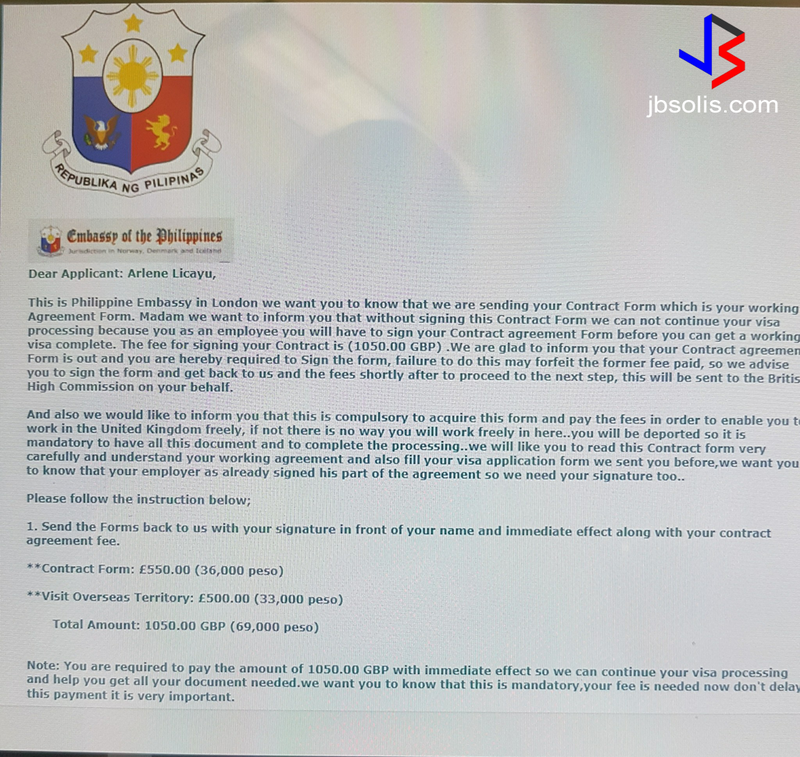 The Head of the Philippine Overseas Labor Office in London Reydeluz D. Conferido is warning the public about another fake UK-based company posting bogus job orders. 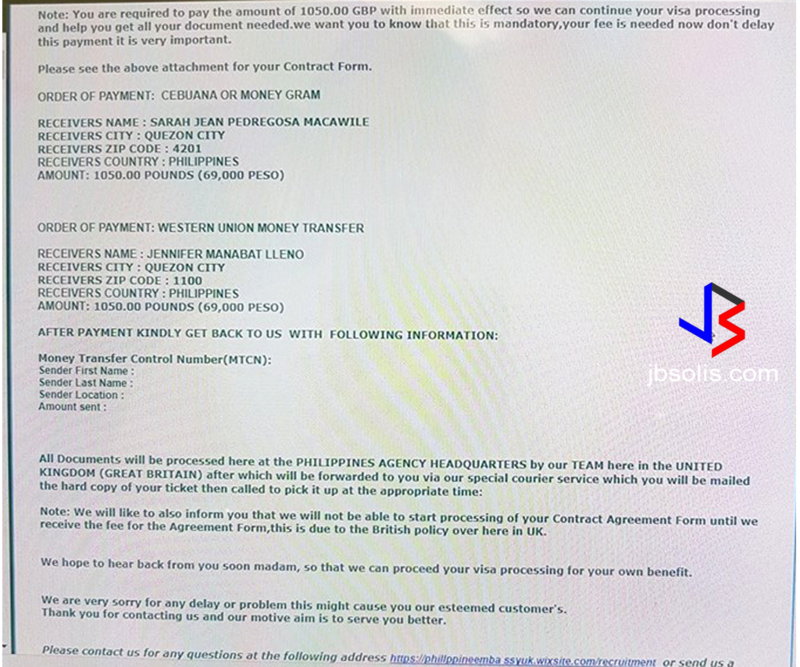 Based on his experience in dealing with such unscrupulous scammers, the Labor Attache believes that the people behind the scam are based in Africa or Eastern Europe. They are apparently offering jobs that the UK Government has deemed exclusive for European Union (EU) and European Economic Area (EEA) citizens only. Another obvious sign that the job postings are fake is that the salaries being offered for some of the skilled labor jobs are higher than that of nurses - an obvious fake. 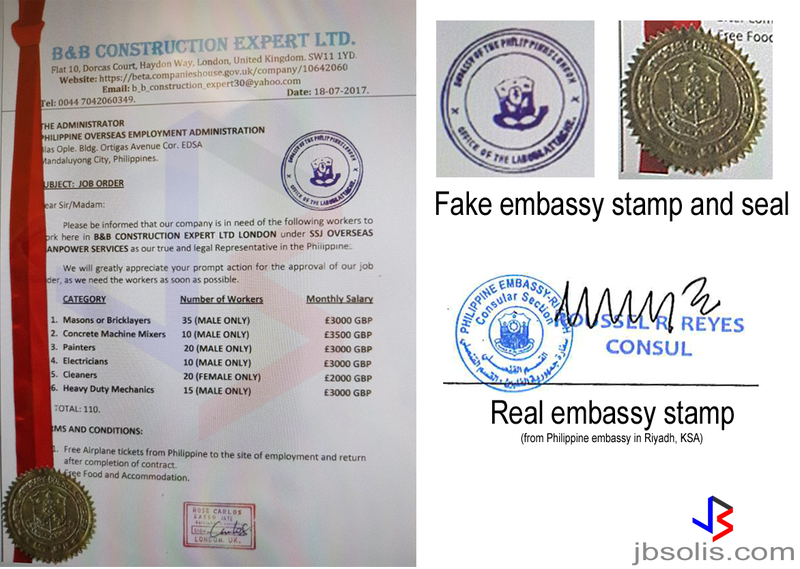 The fake company named "Wilber & Co. Construction Limited" sent the fake job orders to several recruitment agencies in the Philippines in an attempt to dupe people in thinking that they are legitimate. Labor Attache Conferido also warned of a job offer letter for nanny or domestic workers for the UK and is asking for the payment of fees. 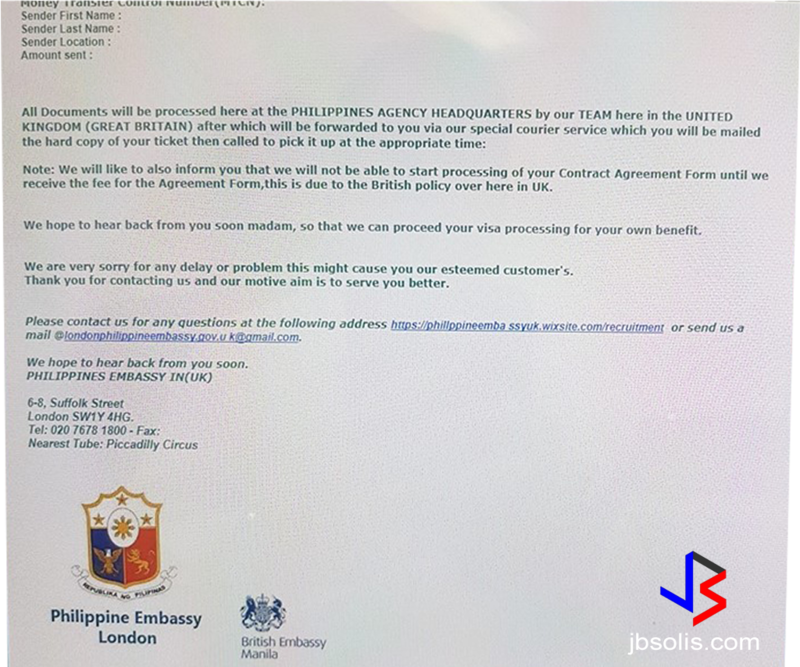 The electronic letters even contain the logos and names of the Philippine and British Embassies to make it appear legal. OFW News: Did Pinay Helper in Hong Kong Commit Suicide in Shenzen China? The appearance of fake job offers have been a huge problem as these scammers have taken advantage of wider social media access and the ease of hiding behind fake e-mail and social media accounts. 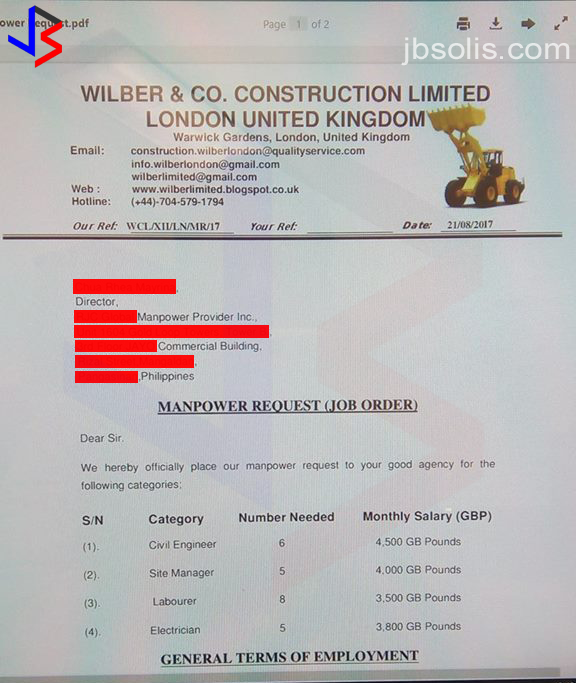 A fake receipt being presented as proof of authenticity of a job order. Notice the fake logo. 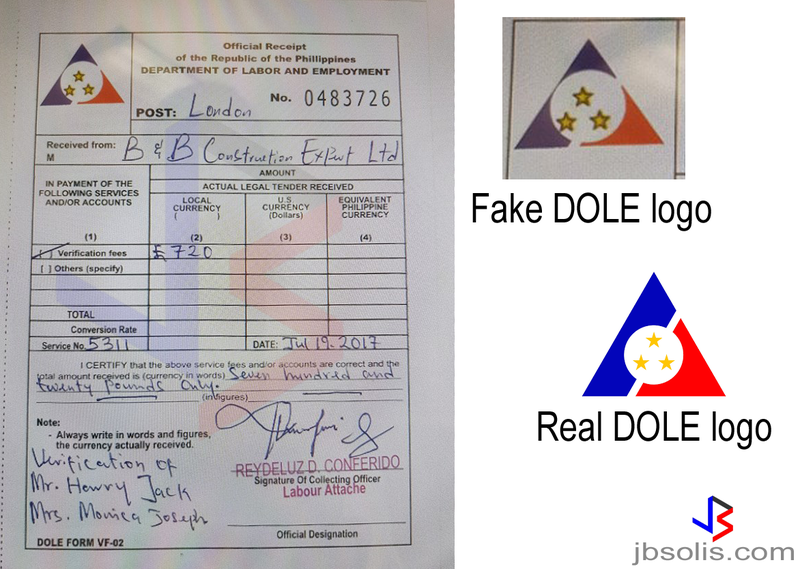 Also, why is the receipt from DOLE, but the transaction in with the Philippine Embassy in London. Real receipts should also be machine validatedNotice too the cost of verification. GBP 720, whereas the real cost of authentication is only GBP 23, add GBP 10 for expedited service. But the modus of fake hiring agencies are not limited to online. Even in the streets if Metro Manila, fake hiring agencies abound, scamming people who unfortunately pass by. See the modus operandi in the video below. Fake job scam is one of the worst kind of scams since the most common victims are those that are actually without work and have only borrowed money just to pay for placement and other fees required for landing a job. Fake jobs are usually offered online. But not all online job postings are fake. E-mail offers are the most common way of spreading fake jobs, but social media is becoming common too. 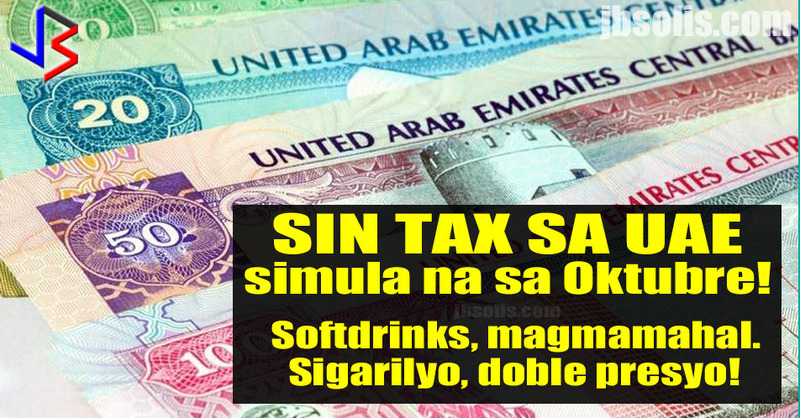 Fake jobs are not published or listed with the POEA. 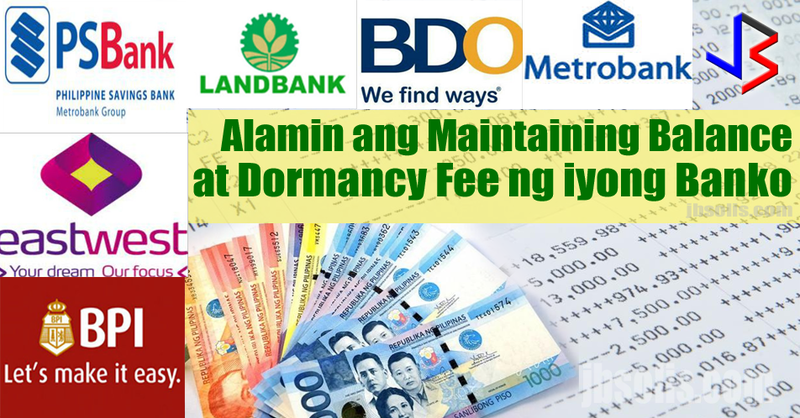 You can always verify information through the POEA website. You can also verify the authenticity of a job order by checking with a local recruitment agency listed in the offer. If a job offer focuses on payment or comes asking for money up front - especially via money transfer, it is usually a scam. If a job is offering an unusually large salary than other similar jobs, it may be fake. If a job offer contains errors in grammar or spelling, or lacks details about the job itself, it is likely a scam. A job offer that uses logos of government agencies, it is likely a scam. 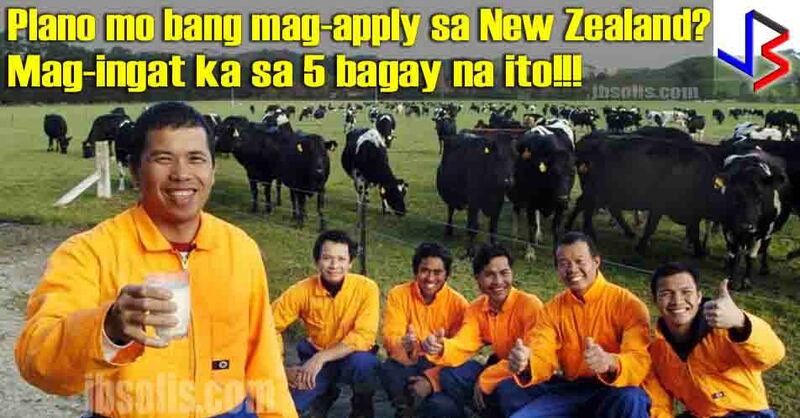 Government to government hiring is only posted via the POEA. Jobs that appear to be from agencies or government offices but use personal e-mail addresses are usually fake. Bigger companies have corporate emails - instead of gmail, yahoo or other personal mail services.